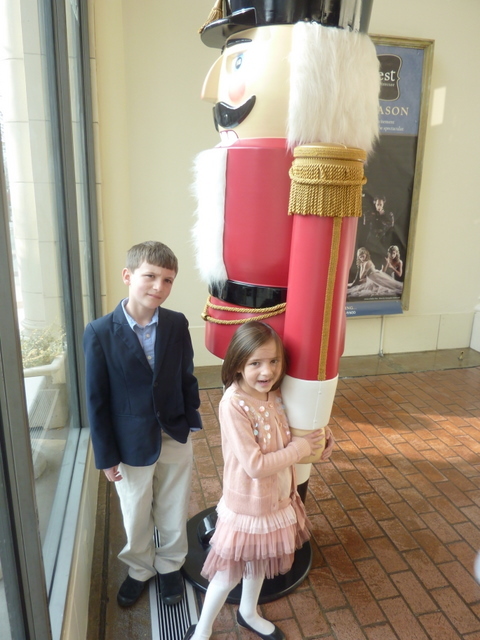 Last Saturday my generous mother-in-law took me, Eleanor, and Jeffrey to see Ballet West’s production of The Nutcracker. It was brilliant stuff. Great dancing, and I was most impressed to see a full smoke ring come out of the cannon during the fight with the Mouse King. Afterwards, there was a “Sugar Plum Fairy” where the kids got to go onstage to meet the performers (Eleanor was way to shy to say anything), have cookies, watch a magician, and — best of all for Jeff — ask the propsmaster all the questions he wanted. Jeff’s enthusiasm must have charmed him, because he let Jeff hold the Nutcracker’s sword, and also try on the big Nutcracker head. “What was your favorite part?” he asked Jeff. “Oh, when the cannon went off!” Jeff replied. Playing “Nutcracker” is now one of the standard activities around here. On Wednesday, the kids even put on costumes and asked if I would film them doing dances. I was more than happy to oblige — and now you can enjoy it, too! It’s five minutes of holiday cheer I’m sure you’ll enjoy.